I have a few ideas for how to pull all this off. I would love to do enclosed storage units (like below) to keep everything hidden, but that's not in the budget right now. I have a few industrial type shelving units down there for now so I need to find a way to hide them from view since they are out in the open. So I'm thinking about doing some kind of space divider to section the storage off from the living space. Maybe a solid wall? Or maybe I'll hang curtains to separate the spaces. Or hang curtains just in front of the shelves instead of blocking off a whole section. Or use pallets to divide the space, which would be cheap and easy! 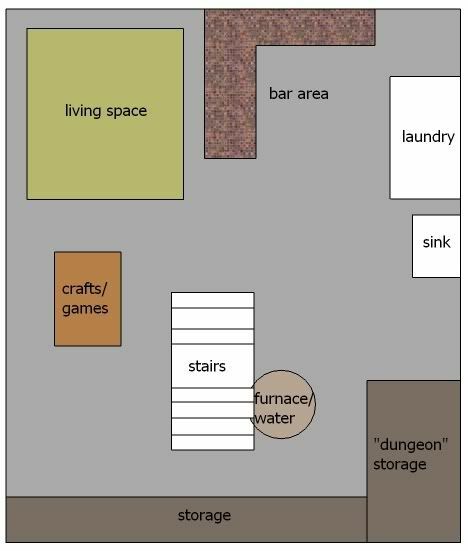 I would love to dress up the laundry area like this and leave it open to the rest of the basement. So I have big goals, but for now I'm working with what I have to get things just organized and liveable. I'll keep you posted and let you know if I get it done this month! Do you have any impossibility to tackle? My biggest project that needs to be finished is painting my cielings and closet doors. The one bonus to living in a small space, is that I don't have room to throw stuff without it looking like a torado went through the room. Today I have been slowly working on my "loffice" so that I can get to items and work in the room. Your inspiration pictures are beautiful! I can't wait to see what you come up with. I LOVE the pallet wall divider idea especially!! I'm really hoping to find some decent pallets so i can give it a try! Thank you! I actually saw you were doing your basement and I was like "yep. that's impossible alright." so I decided to tackle mine. ;) Thanks for inspiring me to get it done!